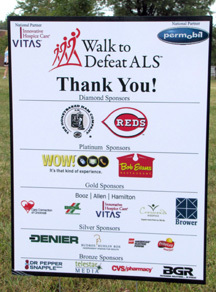 The generous support of our foundation and corporate supporters enables The ALS Association to make a positive difference in the lives of ALS patients, family members and caregivers through our comprehensive research, patient and community services, public education and advocacy programs. The ALS Association is recognized as exempt from federal income tax under section 501 (c) (3) of the Internal Revenue Code and is registered under statutory laws throughout the United States. Our federal tax ID number is 13-3271855.